Robert Youngman (1927- ) created this cast concrete sculpture. 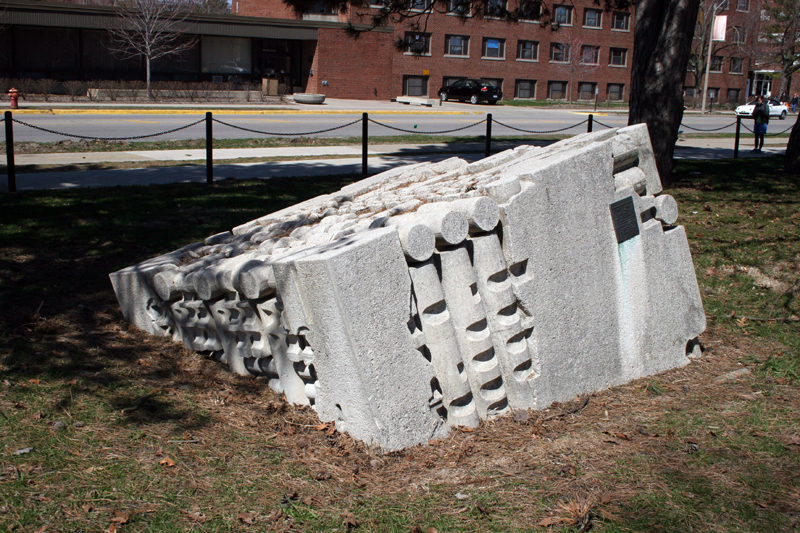 This 5' x 8' x 8' sculpture sits at the northeast corner of Peabody Drive and Fourth street. It was gifted in 1976 through the sculptor, the National Endowment for the Arts, and the University of Illinois Foundation. Centennial commemorates the one hundredth anniversary of the art department's start of classes in the fall of 1876, a full semester before trustees officially approved the department's establishment the following March. 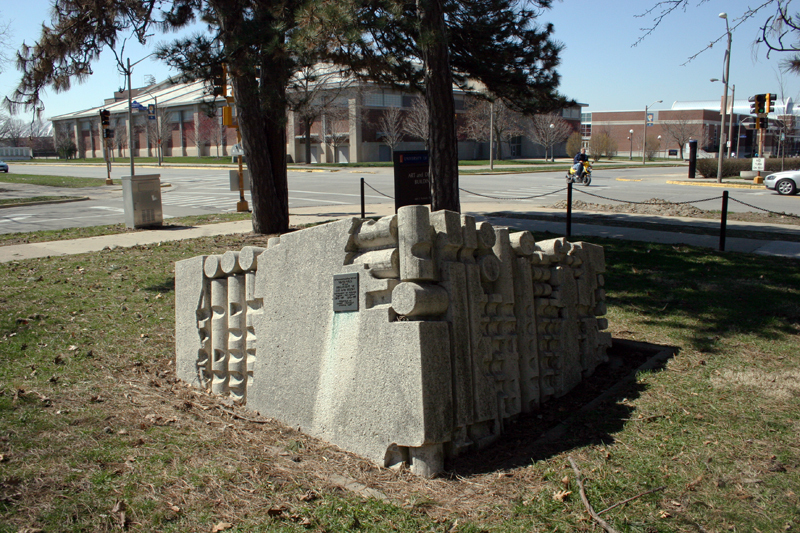 Placed on a grassy comer outside the west end of the Art and Design Building, the sculpture is a hollow, 5-and-a-half-ton precast concrete cubical form with walls eight inches thick. It lies like a puzzling, partially revealed archaeological find slightly below ground level in a square concrete basin. The piece is richly patterned with rough and smooth, cylindrical and sharp-edged, and projecting and receding shapes on which sunlight and shadows cast constantly shifting designs. Robert Youngman, a former professor in the School of Art and Design and director of its art-for-architecture program, believes that the concrete technicians with whom he works deserve credit too. "The most enjoyment to me is the physical part, but you're really not working by yourself. This requires the talents of dozens of people. It's such a long road from the point when you're sketching to where you're actually touching the piece." Always interested in experimenting with various casting techniques, and especially attracted to creating sculpture of enormous size, Youngman counts among his works a city-block-long, two-story high, precast concrete sculpture (the largest bas-relief in the world, according to the artist) in the Manufacturers' National Bank, downtown Detroit; twenty-four sculptured elements for the international terminal of the Detroit International Airport; and a complex, computer-activated, precast concrete water sculpture for Purdue University, Lafayette, Indiana. His most recent work, Triton, is to stand in front of the terminal building of Willard Airport, Savoy. Muriel Scheinman, “Centennial, 1976,” ExploreCU, accessed April 21, 2019, https://explorecu.org/items/show/28.